Baylor University Press, 9781481305488, 229pp. 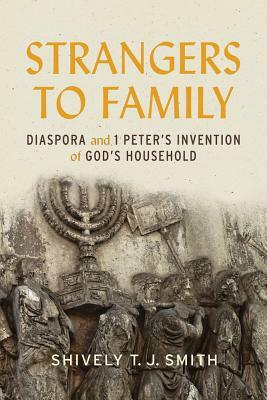 In Strangers to Family Shively Smith reads the Letter of 1 Peter through a new model of diaspora. Smith illuminates this peculiarly Petrine understanding of diaspora by situating it among three other select perspectives from extant Hellenist Jewish writings: the Daniel court tales, the Letter of Aristeas, and Philo's works. Smith's discovery of a distinctive instantiation of diaspora in 1 Peter capitalizes on her careful comparative historical, literary, and theological analysis of diaspora constructions found in Hellenistic Jewish writings. Her reading of 1 Peter thus challenges the use of the exile and wandering as master concepts to read 1 Peter, reconsiders the conceptual significance of diaspora in 1 Peter and in the entire New Testament canon, and liberates 1 Peter from being interpreted solely through the rubrics of either the stranger-homelessness model or household codes. First Peter does not recycle standard diasporic identity, but is, as Strangers to Family demonstrates, an epistle that represents the earliest Christian construction of diaspora as a way of life.